This page was created to give you ideas on how you can customize your new T&E trailer to meet your unique requirements. 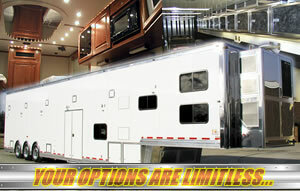 Anything is possible with T&E trailers as all of our units are totally customizable to fit your unique needs and wishes. 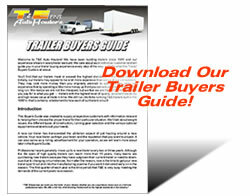 This page shows a cross-section of some of our current customers trailer options and configurations. If you don't see what you have in mind, please ask us...we can design and engineer just about anything you may desire. PLEASE NOTE: Optional equipment and accessories described on these pages may not be available with all trailer configurations. Please consult with our Sales Department at 815-426-2761. Furniture, Cabinets, Kitchen Appliances, Beds, Bathrooms, Corian Countertops, Granite Flooring and More Will Make Your Trailer a "Home Away From Home". Need An Options List Sheet to Print and Read Offline?